Placing snow blower fuel stabilizer in the gasoline you use in your snow blower or any small engine is one of the best things you can do to keep the engine carburetor and filters from getting fouled. When this occurs your engine will either run rough or it may not even start. This of course is not something that you want to deal with when there is a foot of snow on the ground. We suggest that you purchase some kind of snow blower stabilizer and regularly add it to your gasoline tank to keep everything clean and working smoothly every year. 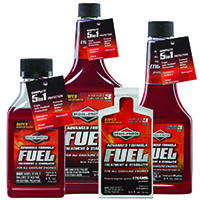 We do not recommend any particular type of fuel stabilizer, just that you use one recommended for your small engines. If gasoline sits in a tank for any length of time, for example over a season, the components of the gasoline will tend to separate and settle on the sides of the tank as well as on the filter of the tank. As it is drawn into the carburetor, it coats the orifice of the carburetor. It. restricts gasoline from flowing smoothly and at the correct mixture of gasoline and air. The engine will not start if the carburetor is badly coated. Insufficient gasoline gets into the engine. If it is not too bad the engine will speed up. Then it will almost stall before repeating the same thing all over again. It makes it really difficult to develop enough power to blow snow properly. Especially when you have lots of heavy snow to deal with. A few dollars spent on fuel stabilizer can prevent all of these issues. It may even save you a trip to the local small engine mechanic as well. Some people have been known to just go and purchase another snow blower instead of getting theirs fixed. Enterprising collectors will take them free of charge. They will fix them themselves and sell them for a few hundred dollars making a nice little profit.